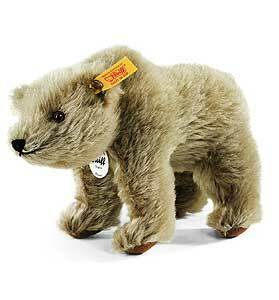 Our classic Steiff Browny Grizzly Bear is made in beautiful brown mohair. This wonderful Grizzly Bear is from the Steiff Classic range and wears the famous brass plated button in ear. Product details: Made in mohair with synthetic filling material, safety eyes, non jointed, non growler, total size 17cm. Item number EAN 037108.